Apple Music is new streaming music service, which competes directly with Spotify, Rdio and others. Until now, the only way to listen to songs on demand through iTunes was to pay for tracks individually. Although Apple added streaming songs as an option with iTunes Match in 2011, it was limited to tracks already purchased or ripped from CDs. Apple later added a Pandora-like streaming radio service called iTunes Radio. iOS 8.4 also includes other updates, including the addition of audiobooks in iBooks, several fixes to the iBooks app, and correcting bugs that affected GPS and the Apple Watch. 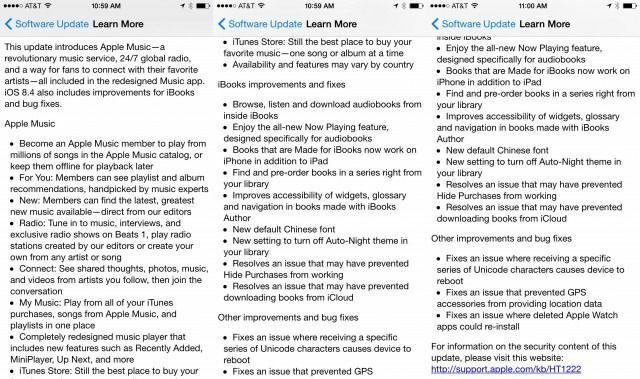 The complete list of new features and fixes in iOS 8.4 is shown below. If you’re a developer and you’re already running iOS 9, Apple is also releasing a new beta that includes Apple Music.